: Oh. MY. G*d!. I loved his looks, his music, I loved hearing the other girls scream. I was only a little girl, but I could feel that excitement. I tell you, my parents, did not. My mother was a trained classical pianist. My father loved Big Band & Frank Sinatra type music. They were not into any country & western or RnB music. Not. At. All! So, feeling all that tension, the love of his other fans vs. the disapproval of my parents only made me love him more! The seeds of rebellion were helped sowed by Elvis! "My Message to Elvis": Elvis, if you are here, I want you to know there is a young woman in England who is hurting real bad. She is one of the greatest voices ever recorded since the likes of Ella Fitzgerald (whom she sounds like) and Judy Garland. She sings RnB type rock n roll and if you hear/heard her, I know you will love her voice. She is not that pretty, rather bizarre looking, in fact. She needs a friend to save her life! A friend like you. If you are still alive, and I am open to that possibility, maybe you ought to go to London and talk to Amy Winehouse. You know the hurting pain that got you into drugs. You know the agony of being famed, and yet, so alone. I heard you also loved to counsel your friends, were very giving of yourself. I heard that you were a spiritual man. In reading biographies of you, I was impressed by the fact that you did not "hang out" with other musicians too much. I think maybe it would have helped you to be "hanging out" with other talented people. To keep challenging yourself, intellectually and musically. It must have been kind of lonely being the head of this pose of people who were all so dependent on you. Like Amy, you too, could have used a little help from your friends in Music World. When you died, they all came out of the closet and spoke so well of you, Elvis. From Elvis to Sinatra. From Debby Reynolds to Ann Margaret. Elvis was loved as an entertainer and respected as a person. Even President Nixon really liked you, and if you are alive, you know that you play an important role in Presidential Library of Richard Nixon. Everybody wants to see you standing with The President. So, I have to say that there is so much I would love to converse with Elvis about, but right now, a young woman of enormous talent is dying and she needs to be saved by the likes of an Elvis. I often wonder if anybody could have given Elvis that "strong talking to" that was needed in last years of his life. : Blue HI is my favorite Elvis movie. It was a beautiful technicolor tribute to a place that is a true paradise on earth. When I finally got to HI, the people there still remembered Blue HI, really loved Elvis and all he did to help promote the beauty of that state. I believe he filmed 2 movies there, plus that famous Satellite Concert, Aloha from HI. 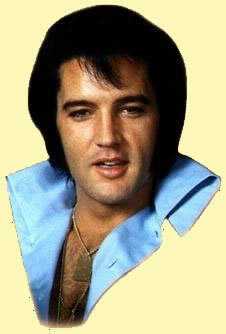 Blue HI had some of the best Elvis ballads, he was young and beautiful himself when he starred in movie. Who could forget the HI Wedding Song? I am so grateful for the time I was able to take a tour of HI rain forest in Kauwai, where his movie was filmed and actually go to the waterfall grotto place where he sang that song! What a way of interacting with heaven that was! HI is like something out of a dream. Elvis capatured the beauty of that State so well. : I loved seeing Elvis in that leather outfit he wore for the Singer TV Special. He looked so sensuous in that suit. His hair, his body posture, his interactions with audiance, it was all perfect. I also think of the late James Dean, whom Elvis seemed to channel that day. The ultimate handsome rock and roll rebel. Besides that stunning leather suit, I loved seeing Elvis in nice talored men's suits. Really, the kind we associate Frank Sinatra with. Beautiful, Italian-Mafia tailoring. Elvis was such a handsome man, and when he wore more conservative clothes, it only made him look more striking. He did not need all those baubles and beads. I was not that fond of his capes and jump suits. I liked my Elvis on the elegant side! : According to most of his biographers, it seemed he had a very strong, maybe too strong, relationship with his mother. However, he was able to grieve and move beyond her, like a normal person. I do believe he loved his wife and daughter in a more traditional sense than most of today's entertainers are capable of. Elvis was definately a Lady's Man if the books are accurate. He had several women, like Ann Margaret, Linda Thompson, Lana Wood, etc he was very fond of and serious about. And yet, I think he would have liked to have ultimately reconciled with his only wife. Pricilla has done a remarkable job of keeping his legend and estate alive. She must have also felt a substantial and mature love for her ex-husband. It's too bad they were unable to "get it together". : I was in New Orleans on my first trip to that beautiful city. It was the first vacation I had taken in years. I was staying in the French Quarter. I was taking a rest from my touring schedule, and I happend to be reading that first notorious bk. about Elvis, written by his ex-bodyguards. The bk. had just been released and I bought it at the airport! Honest, I was lounging on my bed, in the French Quarter Holiday Inn, reading that nasty tell-all on Elvis when the announcement came through on the radio! 8. Why do you think Elvis still attracts new fans every year, even long after his death? : I think it's because we now have wonderful technology to keep the music and movies alive. People who were born post-Elvis, can no see him at his prime, hear him at his prime. Pricilla has done a magnificent job of keeping Graceland a wonderful tourist attraction. Elvis was a very charismatic, handsome, and talented man. We don't get many entertainers of that quality too quickly. We sure do have talent today, I think of Justin Timberlake and Rufus Wainwright. Jay-Zee and the music producer Timberland. Usher. Extraordinary talent that I know Elvis would have loved to have preformed with and helped promote. But we don't have a musical shaman on the ground right now. Although I was impressed with Justin Timberlake and Rufus Wainwright in concert. Both very electrfying preformers. They would both be the first to tell you that Elvis gave American Pop Music an awful lot. He birthed rock and roll as we know it, the meld of RnB with Country. Elvis was about breaking through into bold new forms of music that had not been heard before, by most people. : Sadly, I have not been to Graceland. I have read so much about it. I have persued coffee table books on Graceland so often, I feel as if I have traveled through that house already! I would love to visit Memphis and Graceland before my life is over. Elvis was a trend leader and constantly "transformed" himself in his career, like Madonna & music stars are famous for doing nowdays. Which are your favourite "Elvis eras" in his career? I'm sorry you had to leave us when you did. I think it would have been painful to experience you dying anytime before my own death, for that matter. I followed your talent from the time I was just a little girl of seven to age 30. I want to thank you for the wonderful music! I was thrilled to be able to see you in Los Vegas while you were in your prime, back in 1971 or was it 1972?! Elvis, you were possessed of a god-given talent and voice the likes of which we have not heard from since. You were also aware of your ability to "move" people, to give us music that allows for emotional release of the "blues"; to "turn us on"! Oh, that you did real well Elvis, and I thank you Again!. I wish you had gotten away from Col. in time to make some really good films. It would have been awesome to see you in a movie with Barbra Streisand like A Star is Born. Maybe you would have gone onto Broadway Stage and done a Revival of Carousal, doing the difficult role that John Raitt did. I can hear you doing "My Boy Bill" (or was it my son? ); I can see you in roles like that and winning a Tony award real easy! I can see you in movies portraying all kinds of interesting charactors, musical, romantic, serious drama, you could have done it all. I can see you in a movie like The Jazz Singer, portraying another entertainer from another era, I can see you in a smoldering Tennessee Williams play, being produced as a movie, perhaps co-staring with Marlon Brando. I can see you in winning not one but two or more oscars; one in a musical comedy type film, and the other for a straight dramatic effort. Oh gosh Elvis, you had so much talent and it is just criminal that you were not able to persue you interests and growth as a preformer. Many of us leave earth not doing everything we wanted to do. That is unfortunately, par. Thank you again Elvis. Please know you are loved and remembered. : I am a 60 yr. old F. I am single and live with a beautiful Persian cat in old section of Philadelphia, PA. I love to read and listen to music. I also love to eat! My musical tastes range from collecting harp music to progressive hip-hop. I especially love Doo-Wop harmony music of 1950's. I recently went through a musical passage of listening to Progressive New Age music, but I am now back to basics of rock and roll, and American Broadway, Pop music; Cole Porter, Richard Rogers and Gershwin, that kind of nerd stuff. I also enjoy writing and politics. I love talk radio and listening to and keeping up with the News. I subscribe to several newspapers and magazines. : I think you have a wonderful site and I thank you for all you have put into it! I enjoyed my first visit here this morning. Just participating in these writing exercises was fun. I look forward to coming back here to visit! WOW, This is fantastic! Thank you for your great comments and sharing your feelings on our survey. Frosty, you are one truly devoted fan. I really hope you have the chance to visit Elvis` home. I believe the feelings are overwhelming, many fans tell me of the mighty presents they feel walking through the front door. I also long to make the trip to Graceland & hoping one day it`s possible, I live in Australia. Elvis looked stunning in any costume, but I have to agree with you, Elvis in his black leather outfit performing the 68 comeback special is one my first favorites, he is soooo handsome! I love your expression how Elvis` god given talent effected his fans and he know how to turn us on, it`s so true. Even today, although he has passed on Elvis is having that effect on the younger generation. Elvis is very much loved and missed as much as ever. Frosty I have very much enjoyed reading your survey. Thank you for sharing your devotion to our king. Frosty, Your "Message to Elvis" i have chosen to place in my future book "Messages to Elvis.` Thanks again & Take Care! The Elvis Presley biography contents are solely the opinion of the author and should not be considered as a historical fact or authority on the facts. The author and the Publisher of Elvis Presley biography assume no responsibility or liability and specifically disclaim any warranty, express or implied for any products or services mentioned, or any techniques or practices described. The purchaser or reader of this Elvis Presley biography publication assumes responsibility for the use of these Elvis Presley biography materials and articles and information. Neither the author nor the Elvis Presley biography Publisher assumes any responsibility or liability whatsoever on the behalf of any purchaser or reader of these Elvis Presley biography materials. Description of site contents: This site contains Elvis Presley biography information, history on Elvis Presley life story, Elvis Presley pictures and photos, Elvis Presley biography, Elvis Presley song lyrics, Elvis Presley movie resources, Elvis Presley biography, free e-books and articles listed for your convenient search in subjects of: Elvis Presley pictures and photos, Elvis Presley biography, Elvis Presley song lyrics, Elvis Presley movie resources, Elvis Presley childhood, Elvis Presley biography, Elvis Presley Band members biography, Elvis Presley girlfriends, Elvis Presley biography, Elvis Presley spiritual medium stories, Elvis Presley Memphis mafia stories, Elvis Presley diary quotes, Elvis Presley biography, Elvis Presley movie and music details in relation to the Elvis Presley autobiography and interviews of friends and family members for the Elvis Presley biography website written by a fan for his fans.